Last week was super hectic. As well as cake orders and lots of travelling, I was still determined to experiment in the kitchen! The week before last I was reminded that Pancake Day was on it’s way and so I got to thinking about all my favourite kinds of pancake combinations, both sweet and savoury. I have to say, the older I get the more I appreciate and sometimes prefer the savoury kind. Nothing beats a weekend brunch of freshly made crepes filled with Emmental, some good quality smoked ham and a pinch of black pepper. YUM. 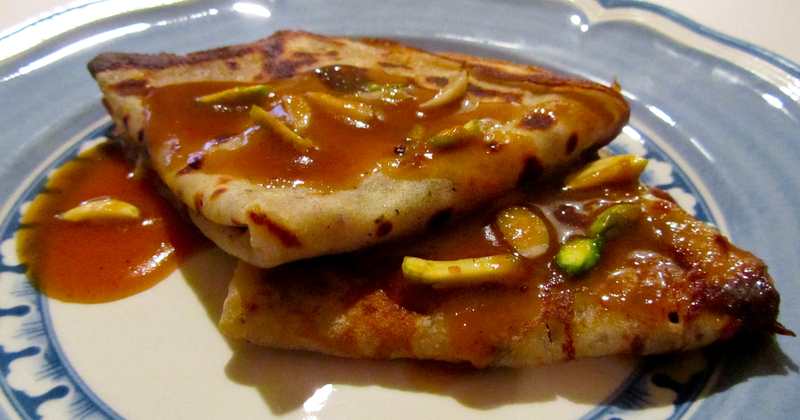 Of course, this led me to think about what I should make this year and it made sense for my mind to wander towards my heritage and remember that pancakes appear in Indian cuisine in a number of forms. 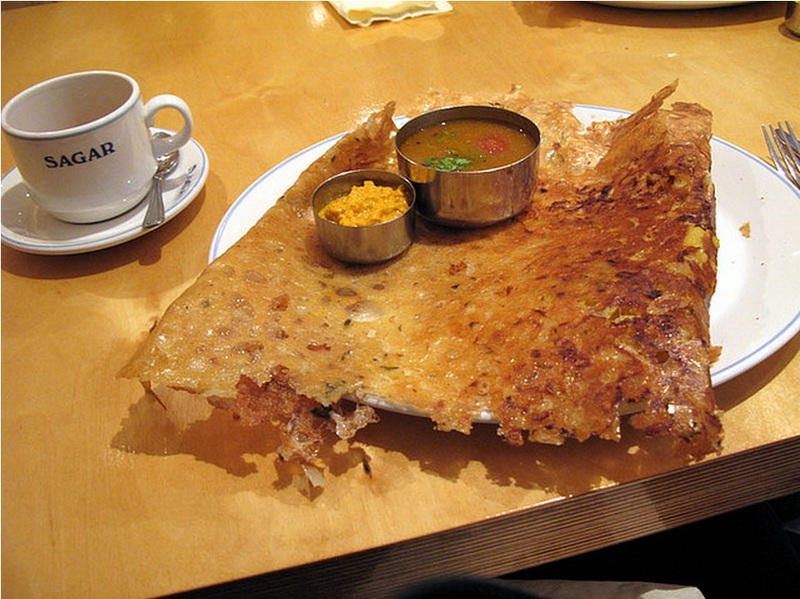 The most commonly known is the thin, crisp, South Indian fermented rice and lentil pancake- the Dosa. This in itself has many many variations from Plain Dosa which is unfilled and eaten with a soupy spicy lentil and vegetable sambar and coconut chutney, Masala Dosa where the dosa is filled with an aromatic spicy potato and onion filling and served the same way as the plain, Paper Dosa, where the Dosa is made larger, but paper thin, Ragi Dosa where the batter is made with millet flour, Rava Dosa– which is my favourite, where the dosa is made much crisper even crunchy because rather than rice and lentils, the batter is made from semolina. The Rava dosa also has variations such as Onion Rava (my all time favourite) where onions are added to the batter. For a thicker pancake there is also Uttapam where the pancake is cooked with the filling in a similar batter to the dosa, resulting in a thicker, softer pancake that also is accompanied by sambar and coconut chutney. Of course we must not forget the sweet variation of the Dosa- the Vella Dosa, made with Jaggery (unrefined cane sugar). The choice is endless! Masala Onion Rava Dosa served with coconut chutney and sambar @ Sagar. My favourite South Indian Restaurant in Defence Colony, New Delhi, India. As a child, I had a particularly sweet tooth and thoughts of the Vella Dosa triggered memories of something similar that I would love to eat when I visited my Grandparents in Kenya. Spending almost all my summers in Kenya as a child, it was my second home. The lifestyle was very different to my life in England, well more for the people around me. My Grandmother didn’t go to work everyday like my mother did, instead she was involved in a lot of social activities. Whether it was to go to the Arya Samaj (the temple), coffee mornings or kitty parties, my daily routine would involve attending these gatherings with my Grandmother. Food was an important part of the culture there. Everything was homemade, from chutneys and acchars (spicy pickles), to fresh handmade vermicelli and spicy savoury snack like Chevda. The hot weather was similar to India and so perfect for maturing or drying these kinds of items. Of course, it was much easier because there were kitchen staff to help with the process, especially with the preparation which was somewhat cumbersome. Nevertheless, everything made was a time consuming labour of love which is why I think it all tasted so good. My Grandmother’s generation were brilliant cooks. Being in Kenya and having limited access to some Indian spices and ingredients, they had to be resourceful and creative. This made the kitchen one of the most exciting places to be as there was always experimentation going on and it was decidedly different to the Indian food my Grandmother would make when she was in England; in fact to my palate it was tastier. The masala fish and chicken she would make is like not other I have tasted anywhere. I remember the aromas that would waft though to the lounge as my Grandmother concocted her dishes. What was also interesting was how there was such a sense of community between the women. They would share recipes and tips, cook together and of course share the delicious produce between each other. My family is originally of Hindu Punjabi origin, but when my grandparents moved to East Africa that there was such a small community of Indian people and so there was a great camaraderie between the different Indian communities. I remember particularly a lot of Gujarati and Sikh friends that my grandparents had. The influence of the individual cultures between the friends as well as the influence of the East African ingredients trickled all the way through to the food they all prepared with so much love. I am so grateful that I have been able to experience and be influenced by all these different flavours. I think this is what planted the seed for me to be the hedonistic cook that I am today…always searching to experience new flavours. If there was one thing my grandmother makes, that to this day, I can never get enough of, it’s her coconut barfi. I kid you not, it is to die for. I don’t know it’s it’s the Kenyan coconuts or just her hand, (I suspect a combination of both) but one day I need to dedicate an entire post to the greatness of her coconut barfi. My thoughts on pancakes made me remember one of my all-time favourite desserts. Malapua. I must have been about 7 or 8 the first time I had this. It was in Kenya at a lunch after visiting the temple and it was being served a prashad (a sweet offering). I remember vividly the shimmering, sugary sweetness of the fried saucers like pancakes ready to be smothered in the comforting creaminess of the accompanying kheer (rice pudding). Malapua is in-between a dumpling/doughnut and a pancake. There are no eggs in the batter and is spiced with fennel seeds and sometimes cardamom. It’s then fried into small saucer like discs and then submerged into a thick sugar syrup. Once removed it develops a glistening sugary crust and is served warm. It can be eaten alone, but whenever I have eaten or made it, it has been served with a rich and creamy kheer that may be jewelled with pistachios and golden sultanas. Utter heaven. Calorific, but oh so worth it! It is the flavours of the Malapua that I love so much and I could not think of a better kind of Pancake to concoct for Pancake day! Blend all the ingredients with a hand held blender or a whisk until smooth. Add the liquid slowly to avoid lumps in the batter. You want a pourable consistency like thick double/heavy cream. Leave to rest in the fridge for half an hour. Heat a nonstick pan on medium high heat and melt some butter- do not let it burn. Put a ladle of mixture in and swirl pan to spread. When bubbles appear and the underside looks golden, turn the pancake. The reason I have sugar in the mix is to get the pancake to caramelise. I cook the pancake until a crispy edge is achieved around the outside of the pancake. Cook according to your preference. Garnish with sliced pistachios and serve with the Spiced Jaggery Caramel sauce, kheer or with rice pudding. Of course they are also delicious on their own too! Melt the jaggery over heat with the tbsp of water and bring to the boil and continue to boil for a minute or so. Add the cream and then the butter and spices and continue to boil until it thickens to a thick pourable consistency. This makes enough for the pancakes above, but feel free to double or triple the recipe to keep some in the fridge. It keeps well for 2 weeks. Serve hot over the Malapua inspired pancakes, icecream, fruit, roast pork, whatever you desire! I suppose you could say that about many European cities. Hey, I’d say it about London too, my (most of the time) home. But Paris is different to the others. There is an elegant, but flamboyant charm that permeates this city like no other. 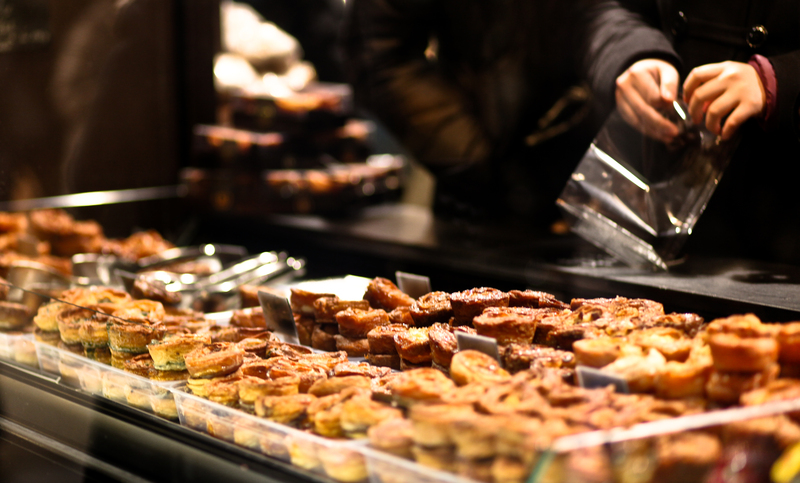 Whether you’re walking through the cobbles streets of upmarket Saint-Germain-des-Prés, eating your way through Les Halles, perusing the boutiques of Avenue des Champs-Élysées or having a magical sensory experience while walking through one of the many bustling food markets Paris has to offer, you will no doubt be in awe of something. I have been many times before, seen the many sights, visited the galleries and museums, but on this visit there was nothing planned. Nothing but to relax, drink and eat well. The French value the time and effort it takes to produce something of quality. And they will pay for it. This trip has reiterated what cooking with love, passion and skill and flair really tastes like. Wine should be served everywhere like it is served in France. Sometimes I want a pichet or a pot for myself! Wine is so much more delicious there. I have a strong desire to spend large amounts of time in France. Nothing is a rush. People are not in a hurry. Dining alone is not lonely. The French truly know how to savour- everything. How can I forget the pastry? ?…… I am but a humble self taught pastry chef (work in progress!) , but there are some French Master pastry chefs and chocolatiers whose palates reside in the upper echelons of this universe. The way they marry flavours, textures, aromas and sights can blow your mind. Food=Love=Art. <3 They inspire me. Of course, I have lots to write about; places to recommend, pastries you must try, streets you must visit etc, but today is a lazy day. Rest assured I will soon. Today is a day for curling up by the fire, watching The Truth About Cats and Dogs and eating a bowl of the French inspired Lentil, Chestnut mushroom and Lardon soup I just made. Soup is one of the most perfect meals you can make. Like a hearty, warm, nutritious hug in a bowl. I am never particular or exact when it comes to quantities and ingredients for soups. You can add or exchange other vegetables if you like. (Celery, tomatoes, potatoes, leek, squash, other beans or lentils would work here too. Think about the flavours you like) It’s the best way to use up odd amounts of delicious vegetables and no-one will ever know :) Depending on the kind of lentils you use, precooked or dried, this soup can take from between 15-30 mins to make. An excellent choice for a midweek one pot dinner. 2 good quality organic if possible, chicken stock cubes- or fresh if you have it. Sea salt/pepper and some herbs of choice…Thyme or sage would be good. If you’re using dried lentils, wash them and keep them on the side. Because Puy Lentils cook so quickly (about 20 mins) and they don’t become mush if you over cook them, I think they are a great choice and very versatile for soups. Apart from their distinct peppery flavours that marries so well with the pork lardons, they can be blended or left whole depending on the kind of texture you are going for. Heat a good sized soup pot on a medium heat. In the meantime, prepare all the veg- cube the onions, mushrooms and carrots all to a similar size. Slice the garlic. Add the lardons or pancetta into the hot pan and stir well so that they do not stick to the pan too much. You are looking to render the fat to cook the rest of the vegetables in. Once golden add the knob of butter, about half the size of a domino and add the onions. Stir well and cook until transparent. Add the garlic and stir well- not allowing it to stick to the pan as garlic has a habit of burning quickly and imparting a bitter flavour that you don’t want! You want to cook the garlic to get rid of some rawness for about 1 minute. Add the mushrooms and stir well. The mushrooms will soak up all of the remaining fat. Don’t worry if the pan looks dry. They will soon start to sweat and cook down and you won’t have them sticking to the pan! Cook and stir for about 1-2 mins. 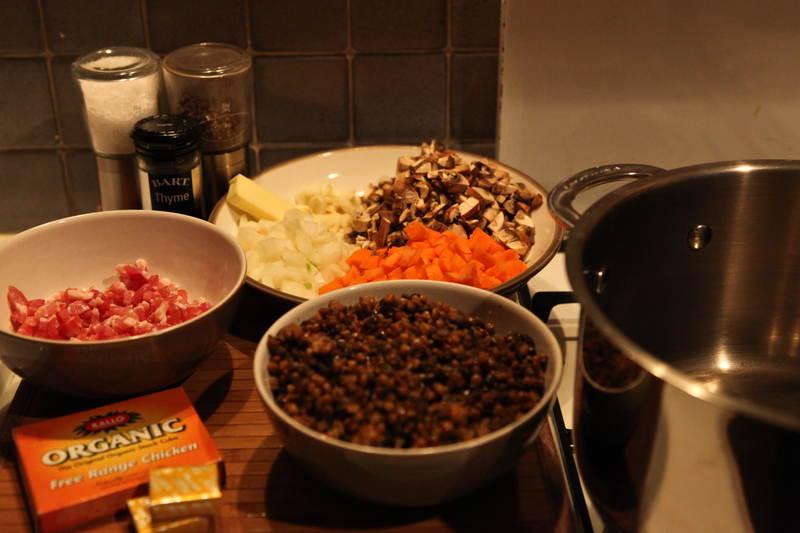 Finally add the carrots and the lentils and stir. You can leave this on the heat for a minute or so while you prepare the stock. Add either 2 stock cubes to enough water so that the water level in the pan is about 5cm (2 inches) above the veg or add the same amount of fresh stock. Add the herbs (fresh or dried) and pepper- I salt at the end so that the lentil cook properly if I’m using dried lentils. Bring to the boil and simmer for 20-25 mins or until the lentils are done. If you are using precooked lentil you only need about 10 mins of cooking time if you are in a rush, although leaving it longer will not harm it either. Taste for salt and adjust accordingly. If you like a chunky soup, serve it as it is, if you prefer a smooth soup, whizz it with a hand held blender. The great thing about Puy Lentils- they work both ways. To serve: Take some slices of sourdough or your favourite bread and rub with a cut clove of garlic, sprinkle with some flaky salt, drizzle with some olive oil and lightly toast on both sides.